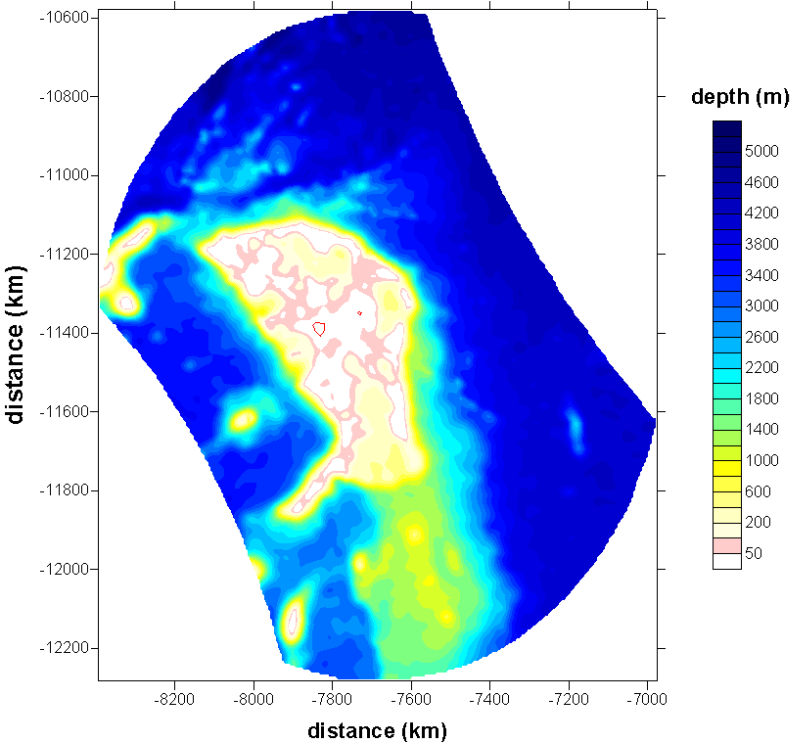 The results shown on this page present the surface elevation and current patterns caused by a propagating tsunami wave which was simulated by means of a tsunami model. The model area with the bottom topography is shown below. The area covers the islands Mahé, La Digue, the shallow shelf, and the deep sea around the shelf. The simulation is based on the assumption that an initial earthquake happened close to the Nicobar Islands and generates a tsunami. The associated wave propagates with high speed towards the Seychelles Islands and reaches the border of the model area at the north-east boundery with a waveheight of 50 cm at model-time = 0. Now the powerfull wave is more and more influenced by the structures of the shallow shelf region. The model simulation confirms the assumption that 150 to 200 km apart from La Digue Island, close to the rim of the shelf at model-time = 72 min, significant structures (variance in amount and direction) appear in the current field, cf. Fig. 1. The extreme changes in the current field and the clearly marked allignment with the isobaths can be used as an indictor for an approaching tsunami. From now on it takes roughly 100 minutes for the first tsunami wave to reach the coast of La Digue Island which corresponds to lead times of the same order of magnitude. Fig. 2 shows the corresponding pattern in the current field at model-time = 166 min. If the simulation proceeds another 30 minutes the larger island Mahé is stroken by the first tsunami caused waves. Fig. 1: t = 72 minutes after model start. Fig. 2: t = 166 minutes after model start. Animation of the tsunami wave height. The model results presented above show current fields with speeds up to 2 m/s which provide some evidence that such features can be most probably be detected and tracked by HF-radar, presumed, that the radar technology allows for sufficient short integration times (roughly 4-5 minutes) which is possible with WERA. Further investigations will be conducted in the near future. The model has been set-up and run by Alexei Androssov in cooperation with Angelo Rubino.